Want to eat out for less than R 20 a day? Or afford a private island hopping trip? It’s one of the best Rand-friendly destinations for South Africans who are travelling on a tight budget. I spent a week in Krabi during my 2-month Southeast Asia trip, and it’s been one of my favourite places. Not only did it cost me less than R 2000 for food and accommodation, but the activities were super affordable as well! 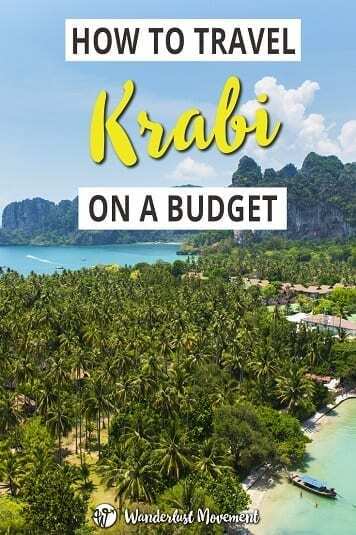 If you’re planning a trip to the Land of Smiles, here are my top tips for travelling to Krabi on a budget. How Expensive is Food in Krabi? 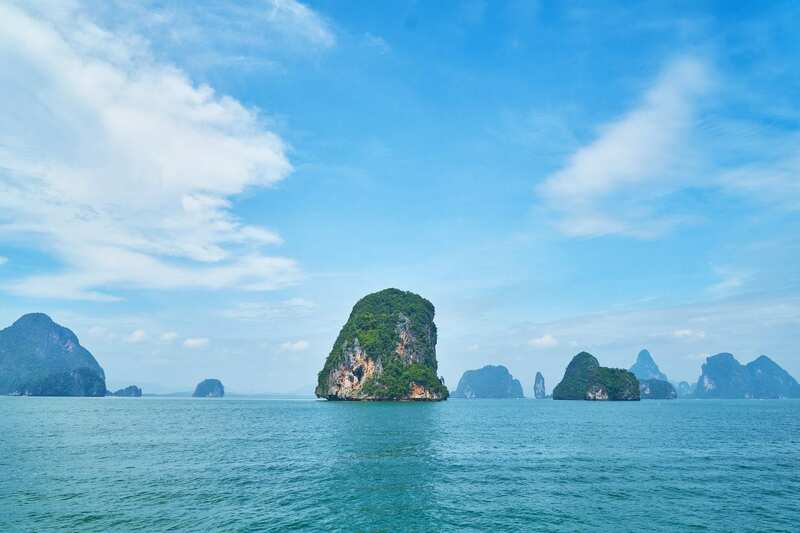 So How Much Does a Trip to Krabi on a Budget Cost? Finding cheap flights to Thailand from South Africa depends on a lot of factors. The biggest ones to keep in mind are the time of year and your flexibility. For example, I’ve noticed that flights to Europe tend to be cheaper at the beginning of the year and start to increase a few months before their high season of June to August. I was able to shave off a couple of hundred Rands on my Thailand tickets by letting the days with the lower prices dictate when I would go. Instead of paying the usual R 5K+ for a return ticket, I paid R4,800.00. It may not seem like much, but every bit goes a long way when you’re planning a trip to Krabi on a budget. Thailand is also the cheapest entry point into Southeast Asia. So if you want to go to Indonesia, Vietnam, Laos or any of the other nearby countries, it’s worthwhile to see if it’s cheaper to fly to those countries once you’re in Thailand. 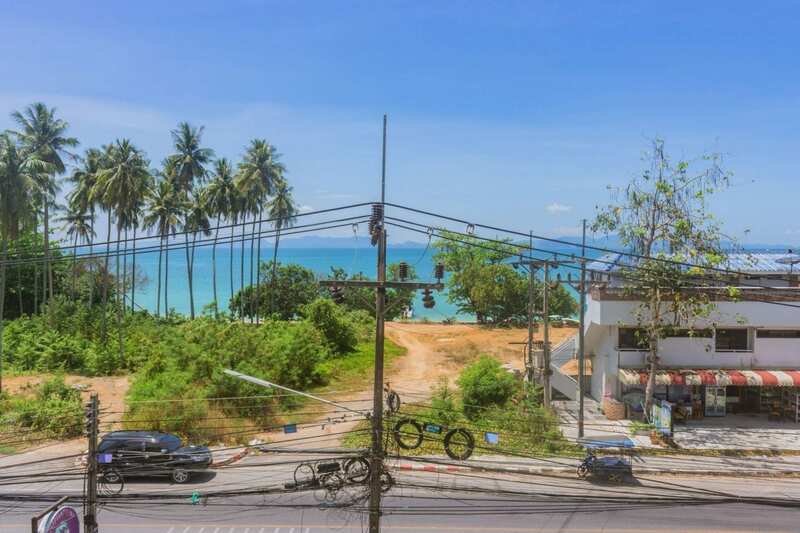 Thailand may not be as cheap as it was a few years ago, but it’s still possible to keep your accommodation costs down. Hostels are my favourite places to stay when I travel. Not only is it a great way to meet other travellers, but if you’re getting sick of dorms, the private rooms are more affordable than a hotel. A lot of hostels also offer kickbacks like free meals, airport pickups and discounts on tours. Poshtel’s are my new favourite thing. The facilities are better than a hostel, and the price is only slightly higher. I stayed at Amity Poshtel in Krabi Town. Unfortunately, I can’t recommend this place as the staff scammed me out of THB 200 for my room key. I was not given a receipt, and when it came time to check out, they refused to give my by deposit back for the key. If you want to experience Krabi’s nightlife, stay in Ao Nang. There are tons of bars and restaurants along the main road, with something always going on. I stayed at Pop-in Hostel on the main road. The hostel is within walking distance to the beach, and all guests get a meal voucher for dinner. The facilities were amazing, and the dorm rooms had a beautiful view of the limestone karsts. R 127.00 for an 8-bed female dorm. Reset Hostel in Mueang is hands down the best hostel I’ve stayed at in my life. It felt more like a hotel than budget accommodation. It’s right across from the beach, there is a free breakfast and snacks throughout the day and so much more. If you want a break down on what makes this place so amazing, read my full review. R 189.00 for an 8-bed mixed dorm. With Railay only a short boat ride away from Ao Nang, it would be a crime not to spend at least one night on this slice of paradise. The only downside is that accommodation options aren’t cheap. There are no hostels on this part of the island. The most affordable place to stay is at Rapala Rock Wood Resort. The facilities are basic, so don’t expect the same standard compared to hotels in Krabi Town. R 390.00 for a private bungalow. 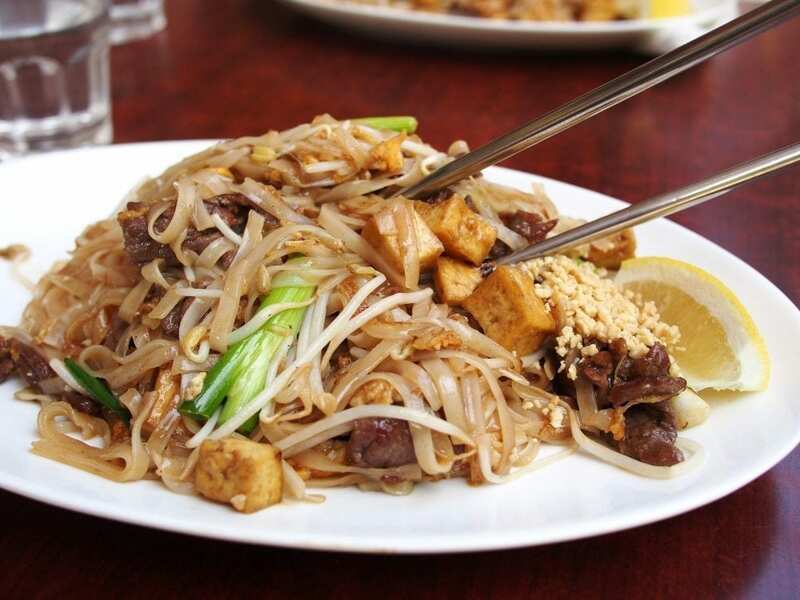 Indulging in Thai food is always a highlight of my trip. The Pad Thai in South Africa doesn’t taste the same, and the restaurants back home can’t compete on price either. Krabi Town: If you go to the night food market, you can get a plate of food around THB 40 – 50 / R 15.00 – 19.00. International and speciality restaurants (like vegan spots) are more expensive. You can expect to pay around THB 250 – 300 / R 96 – R115 for a meal with drinks. Ao Nang: If you go to a local Thai restaurant you can get a plate of food starting at THB 50 / R 19.00. Mueang: The restaurants along the beach differ in price. It’s slightly more expensive than Ao Nang with most meals costing THB 100 / R 40.00 or more. Railay: Prices are higher on this side of the island. Vegetarian / vegan dishes at restaurants cost around THB 150 – 200 / R 60 – 80.00. 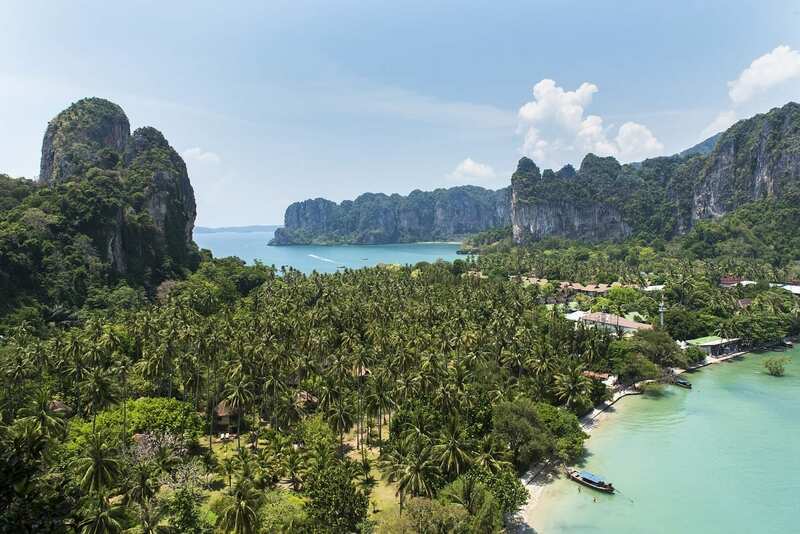 Getting around Krabi on a budget is easy, safe and affordable for South African travellers. There are tons of things to do in Krabi on a budget. You don’t need to sign up for those annoying group tours to experience what the island has to offer. Hike up to Naka Peak: If you stay at Reset Hostel, you can use their shuttle to get dropped off and fetched from the trailhead for only THB 100 / R 39.00. 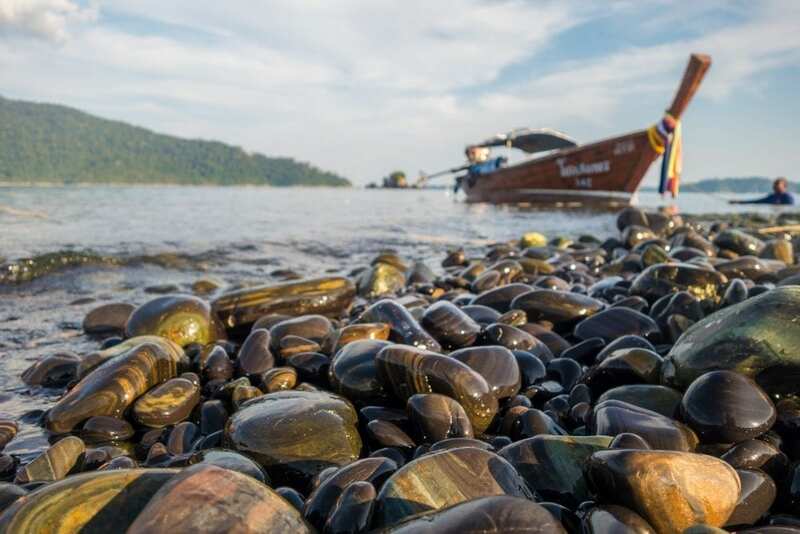 Go on a day trip to Railey Beach: A long tail boat from Ao Nang to Railey costs THB 200 / R 77.00 for a return trip. Rent a kayak or SUP Board: If you want to explore the limestone cliffs around Krabi and Railay, you can rent gear from the locals on the beach. Prices are around THB 300 / R 115.00, but you might be able to negotiate the price down. You can also go SUP boarding at night with FreeBird and see the bioluminescence. 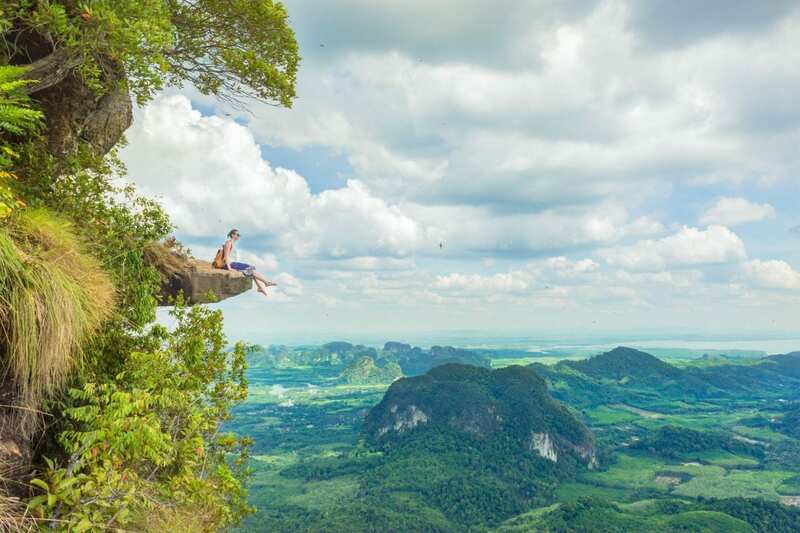 Go rock climbing: You can sign up for a half-day tour for as little as R 400 and explore the beauty of Railay from a different angle. Hire a private longtail boat: Instead of joining a group tour to visit the nearby islands, you can rent your own boat. Prices start at THB 2000 / R 780 for the entire day. You’ll get to choose which islands you go to and how long you stay there. Plus, if you find some other people to split the cost, it starts to become a better deal than the 5 islands trip with 20 other people for THB 1000. To figure out how much money you should bring to Krabi, all depends on your travelling style and how long you want to visit. Dorm room for seven nights: R 127 per night / R 889.00 a week. Street food for lunch and dinner: R 38 a day / R 266 a week. Restaurants for lunch and dinner: R 100 a day / R 700 a week. Hiring a motorbike for a week: R 570.00. Not bad right? Travelling to Krabi on a budget is possible. Instead of bleeding out all your Rands at expensive destinations in Europe, head to Thailand and see more for less. Want more Thailand travel inspiration? Check out my other posts!